As last season concluded with Alfred being revived by the healing waters of Ra’s al Ghul’s Lazarus Pit, Pertwee discussed if there would be any lasting effects from the experience Alfred and Bruce shared. While Pertwee didn’t mention any specific results from the pit he does imply that their relationship will be tested, and Alfred will resort to “who he was,” describing the character as “feral.” Additionally, Bruce will continue to be pulled from light side to dark side, which will most likely be thanks to newcomer Ra’s al Ghul. When asked about relationships Alfred has with other characters and who he would like to see the character interact with more, Pertwee revealed that there will be a “butting of heads” between Alfred and Ben McKenzie’s Gordon. He teased the season’s fourth episode written by McKenzie himself, which they will be shooting shortly. One character who has definitely learned a lot from his relationships with others is Oswald Cobblepot, a.k.a. Penguin. While speaking about the evolution of the character, Penguin actor Robin Lord Taylor said that Penguin has decided to “shut down” as season four begins. Taylor states that a common lesson the majority of the characters on Gotham learn is that when you have someone you love, that love is followed by a vulnerability which doesn’t lead to anything good. Specifically for Penguin, after learning this lesson, he starts off season four stronger than he’s ever been following the ordeal he had with Edward Nygma in season three. Penguin coming in strong will be a good thing in season four, as Taylor implies Penguin and other villains in Gotham City will soon have to compete with that power of Ra’s al Ghul. 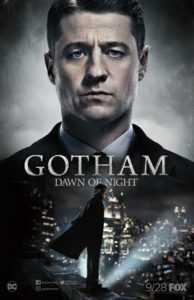 When questioned about how he felt first hearing of Penguin’s true feelings for Nygma, Taylor admitted that there was some surprise, but states that making these shifts in characters’ personalities and stances is something that’s always happened in comics, film, and television in order to “reflect the times.” Taylor even goes ahead and cites an event in Batman comics in the 1980s where Penguin became more of a physical villain, learning karate, which is something current comic book fans would probably not expect to see from the character in comics today. According to Smith, this quest will lead Nygma to both Morena Baccarin’s Lee Thompkins and Solomon, which we can probably assume is Solomon Grundy. The fan-favorite zombie-like character from DC Comics was teased in Gotham‘s season three finale. With Solomon Grundy already confirmed to join the Gotham ranks, what other characters from the Batman mythos can we expect to see in season four? Producer John Stevens goes on record stating that there are no plans to bring Harley Quinn into the series, implying that Erin Richards’ Barbara Kean has already filled those shoes in her own way. Stevens does reveal the inclusion of a Batman villain with a little less history in the comics than Harley Quinn, and that is Professor Pyg. Created by Grant Morrison and Andy Kubert and first appearing in 2007, Professor Pyg will appear as a new horror in Gotham City. While Pyg wreaks havoc on Gotham, Ra’s al Ghul will come in as a new “father figure” for Bruce. When asked if Talia al Ghul would ever make an appearance on the series, Stevens denied that she would ever make an appearance, stating that she is currently “exclusive to Arrow,” but another character related to Ra’s will definitely appear in the latter half of season four. It sounds like Gotham will take these beloved characters into plenty of new territory this upcoming season as new concepts and experiences are laid out, and new characters are introduced. In addition to what was revealed in the preceding interviews, a brand new trailer for Gotham’s fourth season was revealed at this year’s San Diego Comic Con. Check out the trailer below, which sees Bruce and Selina come into their own and also reveals the debut of the Scarecrow. Feel free to let us know what you think in the comments, and tell us what you’d like to see from Gotham‘s upcoming fourth season premiering September 28.